ATLANTA — Bridgestone Americas is launching a campaign to help educate fleets about and dispel common myths regarding retreading tires, the company announced. 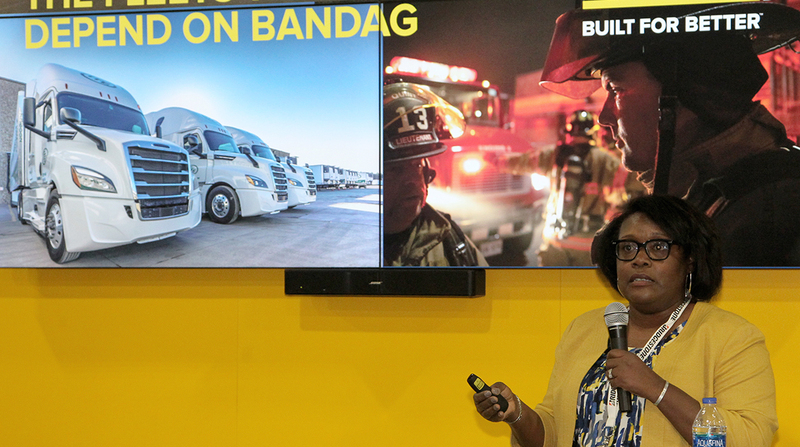 The “Fleets We Depend On” initiative is targeted to small- and medium-size fleets in sectors such as first responders and school districts, and is designed to illustrate that retreading is a viable option for their everyday needs, Bridgestone said in a March 19 media advisory tied to the program’s unveiling at American Trucking Associations’ 2019 Technology & Maintenance Council annual meeting here. Bandag is a retread division of Bridgestone. To coincide with the launch, Bridgestone will host a 27-stop roadshow at dealer and company locations in the United States and Canada. It will include an interactive truck exhibition featuring information about the retreading process and comment from experts on Bridgestone tire casings and Bandag retread combinations that are designed to work together. The roadshow will run through July 2019, and include stops in Atlanta; Nashville, Tenn.; Phoenix; Indianapolis; Akron, Ohio; Orlando, Fla., and Elizabeth, N.J. The roadshow also will give fleets a chance to nominate themselves for Bandag’s Fleets We Depend On Award, which will spotlight individuals and fleets. The winner will be announced in September and receive a cash prize of $5,000 and a matching donation to a 501(c)(3) organization of its choice. Nominations also can be made at Bandag’s website.